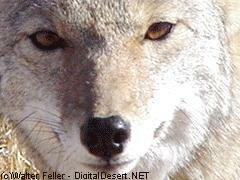 About eighty percent of coyotes live in packs of 3-7 in size. They display a complicated social structure with both dominant and subservient behavior. They mate in January/February, and are partners for life. After a gestation period of 60 days, litters of 2-12 pups are produced. Litter size is determined by the area's available food supply. Coyotes can be very defensive of their pups and it is a good idea to avoid their burrows from early spring to mid-summer. During this period they can be very aggressive to humans.